Leaf: 620 x 409 mm; miniature: 210 x 275 mm. – 6 four-line staves ruled in red with square musical notation, three of which in the blue incipit field. This monumental 'Resurrection of Christ', in the historiated initial R, is surrounded by a full ornamental and figurative Renaissance border. It is an excellently preserved, large leaf with a breath-taking miniature from a liturgical codex. The artist is yet unknown but ranks among the best Lombard artists from the end of the 15th- to the beginning of the 16th century. It is an important contribution to the art of Italian Renaissance illumination. This leaf comes from an enormously large choirbook which must have been an excessively costly commission. 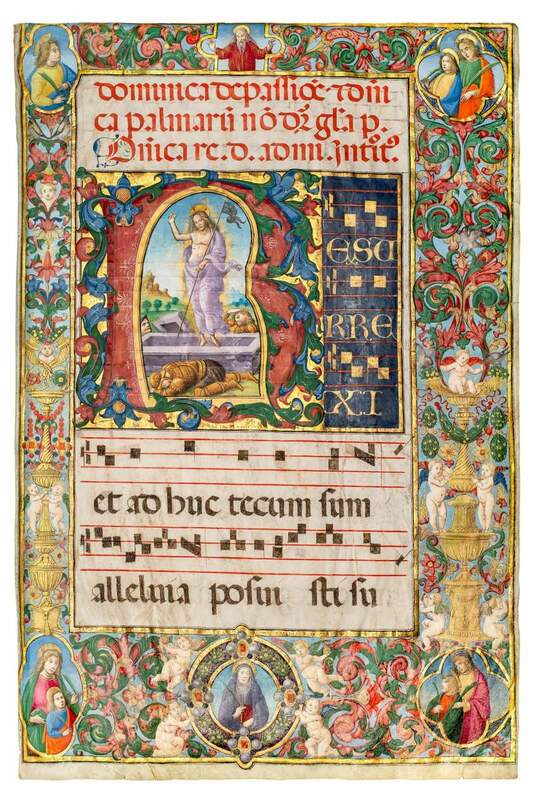 In some aspects, the present miniature recalls the style of the renowned illuminator Fra Antonio da Monza (active in Milan and Rome from about 1490-1528), who has been identified through signed work made for Pope Alexander VI. He was a native of Monza, outside of Milan, and a member of the Franciscan Order. Very little is known about the biography of this highly esteemed Renaissance artist other than that his work was certainly influenced by Leonardo da Vinci and that he is known to have executed commissions for the Sforza family. However, our imposing leaf shows some significant differences to Antonio’s works, especially in the border decoration, where our illuminator demonstrates a more traditional approach: the painted frame consists of lush acanthus leaves, in which naked putti play, intermingled with gilt candelabra ornaments, festoons, garlands of laurel, strings of coloured beads with gemstones. Within six picture fields a variety of figures represent: God the Father, the Virgin Mary (or could this be St. Monica?) and various martyr-saints. The large format, historiated initial and the text field with Resurrexit are spread across the width of the written space. Both text and musical notation are written in gold on a dark blue ground and the three staves are drawn in red. The initial R appears on a burnished gold ground. The letter’s body is red, adorned with delicate white ornaments, and surrounded by rich curling acanthus leaves in red, blue, and green. In the inner part of the initial, Christ has risen from a pale purple sarcophagus that matches the colour of his mantle. His raises in triumph, blessing and holding the cross banner. Two guards are witness to the scene and gaze up unbelievingly at the risen Saviour, while the third is asleep. The faces of all figures are finely drawn. The palette of the miniature is rather subdued compared to the vivid colours of the surrounding borders.